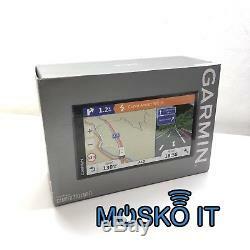 Garmin Dezl 770LMT-Dâ7 GPS SatNavâCamper Motor homeâLifetime EU Maps+Traffic. The item pictured is the item you will receive. Garmin Dezl 770LMT-D7 GPS SatNavCamper Motor homeLifetime EU Maps+Traffic. Garmin Camper 770 LMT-D Sat Nav The Garmin Camper 770 LMT-D Sat Nav is a specialized sat nav with large 6.95-inch edge-to-edge touch screen and camper-specific features including road warnings and custom routing for the size and weight of your camper or caravan. Find your preferred campsite or stopover place using filterable directories from specialist sources including ACSI, NKC or MHF. Keep your hands on the wheel with Bluetooth hands-free calling, voice-activated navigation and onscreen smart notifications (calls, texts and other app alerts). Camper 770LMT-D comes with free lifetime map updates for the UK and Full Europe (45 countries) so you can drive confidently with the latest map data available. Enhance your journey with free digital traffic alerts, real-time parking information, basic weather forecast, Live Track feature (Smartphone Link App required) and TripAdvisor data. Garmin Camper 770 LMT-D Sat Nav Extra Info Specialised sat nav for caravans and motorhomes with large, easy-to-read 6.95-inch edge-to-edge touchscreen display Preloaded with detailed maps of the UK, Ireland and Full Europe (45 countries) with FREE lifetime map updates Free Garmin Digital Traffic via DAB provides reliable traffic alerts to avoid incidents and congestion on your route Youll know how many minutes of delay to expect and if there are any possible detours. It can even confirm whether or not you are on the fastest route Live parking information for on and off street parking at your destination Built-in Wi-Fi for easier-than-ever map and software updates when connected to a Wi-Fi home network Pair your smartphone and your sat nav via Bluetooth to get hands-free calling, voice-activated navigation and smart notifications for calls, texts and other alerts straight onto on your sat nav screen Live Track allows drivers to share their routes with others Custom routing and trip planning for the size and weight of your camper, motorhome or towable trailer Road warnings for sharp curves, camper speed limits, speed cameras, bridge heights, weight limits, narrow roads, steep hill and more Includes directory of campsites from NKC, MHF and ACSI with search filter and live parking information for parking at your destination TripAdvisor ratings for travel points of interest (POIs) such as hotels, restaurants and attractions What's in the box Garmin Camper 770 LMT-D Vehicle suction cup mount Vehicle power cable USB cable Quick start manual. _gsrx_vers_841 GS 7.0.16 (841). We understand the importance of getting your order to you as quickly as possible. We work hard with all of our customers to ensure that they are getting an excellent shopping experience. Garmin Dezl 770LMT-D│7 GPS SatNav│Camper Motor home│Lifetime EU Maps+Traffic Garmin Camper 770 LMT-D Sat Nav The Garmin Camper 770 LMT-D Sat Nav is a specialized sat nav with large 6.95-inch edge-to-edge touch screen and camper-specific features including road warnings and custom routing for the size and weight of your camper or caravan. Garmin Camper 770 LMT-D Sat Nav Extra Info •Specialised sat nav for caravans and motorhomes with large, easy-to-read 6.95-inch edge-to-edge touchscreen display •Preloaded with detailed maps of the UK, Ireland and Full Europe (45 countries) with FREE lifetime map updates •Free Garmin Digital Traffic via DAB provides reliable traffic alerts to avoid incidents and congestion on your route •You’ll know how many minutes of delay to expect and if there are any possible detours. It can even confirm whether or not you are on the fastest route •Live parking information for on and off street parking at your destination •Built-in Wi-Fi for easier-than-ever map and software updates when connected to a Wi-Fi home network •Pair your smartphone and your sat nav via Bluetooth to get hands-free calling, voice-activated navigation and smart notifications for calls, texts and other alerts straight onto on your sat nav screen •Live Track allows drivers to share their routes with others •Custom routing and trip planning for the size and weight of your camper, motorhome or towable trailer •Road warnings for sharp curves, camper speed limits, speed cameras, bridge heights, weight limits, narrow roads, steep hill and more •Includes directory of campsites from NKC, MHF and ACSI with search filter and live parking information for parking at your destination •TripAdvisor ratings for travel points of interest (POIs) such as hotels, restaurants and attractions What's in the box •Garmin Camper 770 LMT-D •Vehicle suction cup mount •Vehicle power cable •USB cable •Quick start manual _gsrx_vers_841 GS 7.0.16 (841). The item "Garmin Dezl 770LMT-D7 GPS SatNavCamper Motor homeLifetime EU Maps+Traffic" is in sale since Sunday, February 24, 2019. This item is in the category "Vehicle Parts & Accessories\In-Car Technology, GPS & Security\GPS & Sat Nav Devices\Portable GPS Systems". The seller is "moskoidevices" and is located in Nunhead. This item can be shipped worldwide.